Scheduling text messages is one of the most convenient features that people feel a need of. Many time, we require delayed messages to be sent at a specific time, and message scheduling helps us achieve that. However, it’s a feature which is currently not present natively in iOS devices. Thankfully, there are a few third-party apps that allow us to send delayed text messages on iPhone XS/XR/8/7. Scheduled is one of those iOS apps that allows us to draft and schedule a text message on iPhone, which then can be sent via iMessage, Facebook Messenger, Twitter, WhatsApp, etc. The app has a very simple and easy-to-use UI. It is very intuitive and make scheduling messages breezily. Download Scheduled from the App Store on iPhone. Open the app and permit it to access your contacts and to send notifications. 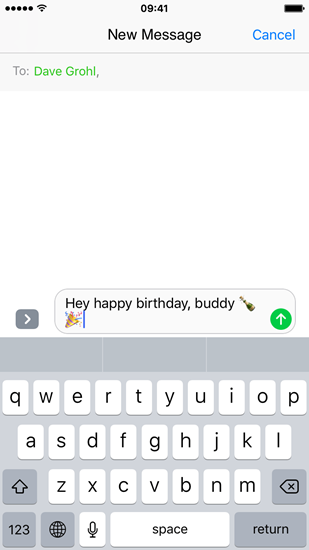 Tap on the “Create Message” button to start scheduling a text message. Tap on the “Select Recipient(s)” button to select one or more contacts from your Contact list. 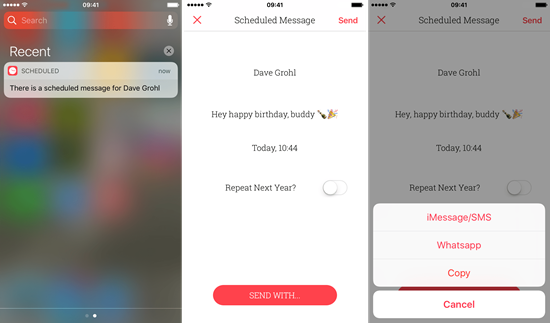 Tap on “Your Personal Message…” to type in your delayed message. When the above steps are done, just click the “Schedule Date” button. 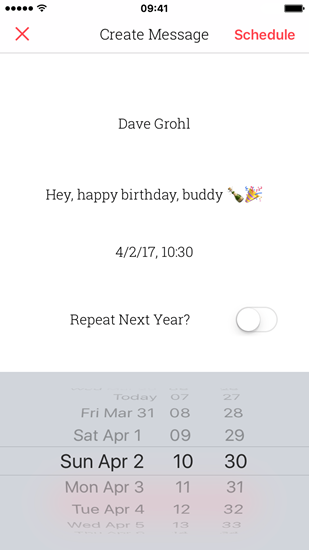 You will be presented with a date-and-time scroll to select a specific time that you want to be reminded of your scheduled message. When all is done, just tap on “Schedule”. When the scheduled time comes, you will receive a notification reminding you to send that message. Tap on the notification to launch the Scheduled app and tap on “SEND WITH”. Select the “iMessage/SMS” option, from the list of options presented. Then the Message App will pop up with the scheduled text and the recipients prefilled. Now just send the message. And you can also send schedule texts on iPhone to WhatsApp or alike. Because iOS is not as open as Android, no app has the complete functionality to send SMS without the user’s approval. 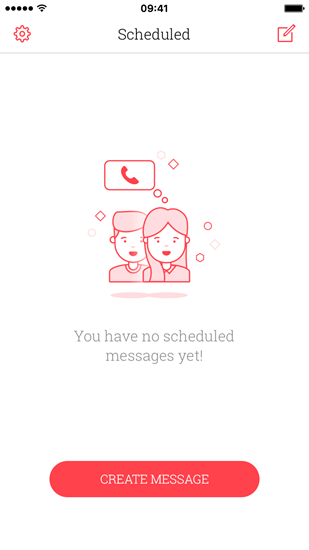 Hence any message scheduled via the SMS scheduler apps will not be sent on its own. It will require an interaction from the users to get confirmation of the message sending. This is a limitation set by Apple exclusively for the privacy and security of iOS users. But due to the above mentioned limitation, completely scheduling a delayed text message automatically without manual operation on iPhone is impossible, and thus Scheduled app is the best app currently for the job. It offers a functionality, that is as close to the desired functionality, as one can get on iOS currently. The app offers a service to actually send scheduled messages for 1.99$ per month. To provide the service, the app will use its own server to complete users’ requests. It may be costly, so some of you may think if there’re other ways out. To be able to actually send delayed messages automatically at a specific time, one needs to jailbreak one’s device. And there are many tweaks available that enable this scheduling function on jailbroken iOS devices. 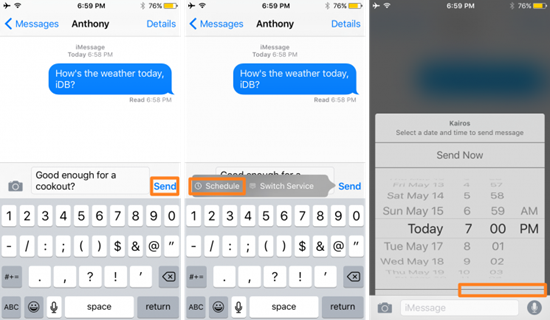 If you have a jailbroken iDevice then you can use Kairos, which is one of the most popular tweaks for scheduling text messages on iPhone. It enables the scheduling feature in the stock Message app of Apple. Make sure you have Kairos on your jailbroken iPhone. 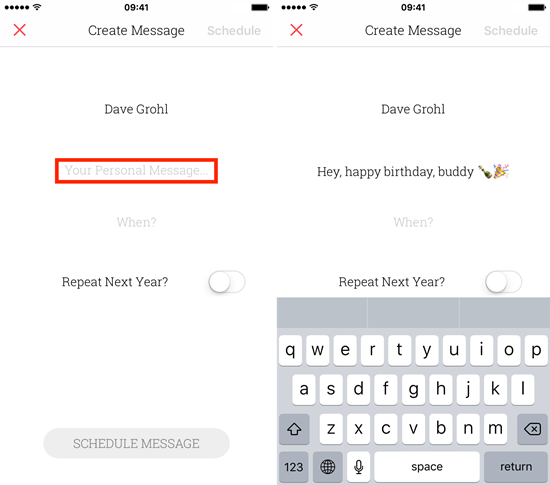 To schedule a message, all you need to do is Tap & Hold the Send button after you draft a message. This will prompt a pop-up which has the option to schedule texts. Click on “Schedule” and you will be offered with a familiar option to select when you want to send the message. Once a message is scheduled, it can be viewed on the main message thread screen via a newly-added folder icon at the top. When the folder icon is clicked, you see a list of the messages that have been scheduled to be sent at a specific time. And then your delayed message will be sent at the scheduled time automatically. Though it is a very useful feature, scheduling a text message is something iOS users can’t do natively by now. However, it’s definitely a useful feature Apple should enable in its Message app for both SMS and iMessage. 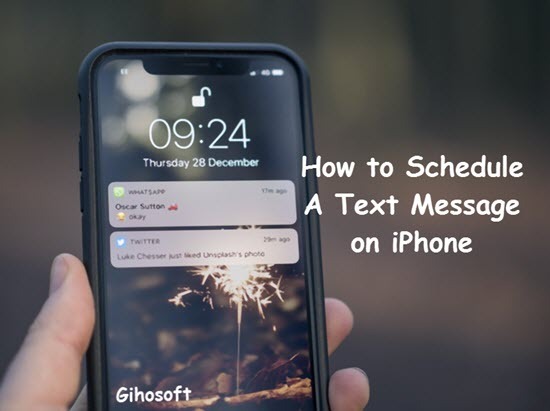 Luckily we have this guide for you to send a delayed text on iPhone, and hope it will work untill Apple allows this function natively or opens an api for it. If you lost any text or iMessage on iPhone, Gihosoft iPhone Data Recovery will help you fix this urgent problem to get back the deleted messages on iPhone as soon as possible. It’s a handy professional tool for lost data recovery on any iOS device, capable of recovering various data types like photos, videos, contacts, call history, WhatsApp/Viber chats, notes, voice memos and so on.